Are you interested in feeding your cat raw food? 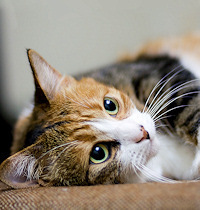 Many cat owners are convinced that feeding a raw diet to cats is the best food for their pets. They read about formulas and feeding guidelines and then never get their pet started. Pet parents become overwhelmed and intimidated by reading information about raw feeding that appears to be too complicated, inconvenient, expensive, and time consuming. In this article, you will learn what is truly essential to begin transitioning your pet onto raw foods. Discover how feeding your pet a raw food diet can be inexpensive, virtually hassle-free in preparation, and without needing to fuss about supplements or providing all sorts of exotic, expensive meats as part of their feeding program. The best way to get started with feeding your cat home-prepared raw meals is to understand that raw feeding does not have to be on an all-or-nothing basis. In reality, your furry companion does not have to be fed fresh raw meat for 100% of its meals to receive the benefits that a raw-fed nutritional plan offers. You can feed a part-time raw and part-time commercial pet food diet and still significantly reduce health risks associated with commercial feeding than if you never feed your pet raw meals at all. In fact, a good number of pet owners accommodate their pets as best they can by feeding raw meals only part of the time. For new raw feeders, the biggest concern is whether or not the raw-based nutrition they plan to provide will be complete enough to keep their pet healthy. The most simple and perfect way to go forward with a transition to raw, is to get as close as you can to offering balanced raw meals while using the help of a quality, commercial pet food fed intermittently to fill in for any potential nutritional gaps. On a full-time 100% raw-fed diet, a rotation of three or more different kinds of animal protein is recommended to achieve a more sustainable nutrient balance and to maintain good health over time. If it is difficult to feed a completely balanced raw diet full time, allow reasonable room for intermittent consumption of commercial pet food. It is a sensible and safe practice which ensures that nutrient deficiencies will not occur while allowing your pet to enjoy fresh food free of synthetic additives, the way it would be consuming its meals in nature. Remember, the intention of feeding raw meals to your pet is not necessarily to completely eliminate commercial pet food from their diet, but to eliminate processed foods from being their one and only source of nutrition. Your main focus on raw feeding can become as simple as occasionally providing edible muscle meat with a bit of organ, and then alternating with a quality, commercial brand to take care of the rest. Nearly any federally inspected and approved raw meat whether it is organic or not, is going to be more favorable than a 100% commercial pet food diet as long as the dietary balance over time includes sufficient vitamins and minerals. You can hand-cut, mince or coarsely grind common meats found at your local grocery store. You do not need expensive equipment or even a local butcher who deals with organic parts and organs to get started with raw feeding. Hard working dark muscle meats; chicken thighs, hearts and gizzards are natural sources of taurine, an essential dietary requirement for feline health. Chicken livers and beef kidneys are easy to find in local grocery markets and are two key secreting organ components which fulfill essential vitamin requirements. Simple poultry meats such as gizzards, hearts and liver sell for less than $2.00. • Fresh gizzards and hearts are often packaged together and sold for less than two dollars. • A container of chicken livers also sells for fewer than two dollars. • Fresh boneless, skinless chicken thighs and packaged beef kidney are often marked at three dollars or less. A single, medium-sized adult cat can get through a week’s supply of home-prepared raw gizzards, hearts and livers for as little as $5.00. The rest of a week’s feeding costs to balance the diet depends on if you want to add other types of meat and organ and what your quality commercial food normally costs. You can essentially feed your cat a healthy and balanced rotation of raw and commercial food for an entire week for less than $10.00. When feeding super-premium pet foods alone, this ultra-low cost is unheard of. Now, with the need for adding supplements and having to procure different types of animal proteins out of the way, what is the next thing that would hold any cat owner back from feeding what their pet would eat in nature? Taking the time to transition them to eating freshly prepared raw food is the next task. • Never feed a raw meal to a cat who has consumed dry kibble within 8 hours. • Cats need time to tune their senses to what their new food smells like and tastes like. • Pets may also need time to become increasingly familiar with their food’s new texture and appearance which may be largely inconsistent from raw meal to raw meal because the food is no longer mass manufactured in a factory! • If your cat is addicted to kibble and will not touch wet food, the internet has a wealth of information about how to successfully transition your cat off of the dry food and onto canned. The most conscientious pet owners wait out however long it takes for their cat to develop their recognition and taste preference to the new food. With patience, persistence and loving encouragement, most cats will come around to eating raw food when it is offered. The truth about pet food is that even the very best packaged, commercial preparations from a manufacturer are still processed foods. Even if you cannot feed home prepared raw 100% of the time, your cat can eat healthy on raw meals part-time. An occasional raw diet can be easy, inexpensive, and has benefits that outweigh the costs and risks of feeding your pet a 100% commercial pet food diet for life.